The FBI says proper protocol was not followed in following up on a tip about Nikolas Cruz, the suspect in the mass shooting at a South Florida high school on Wednesday that left 17 people dead. A law enforcement source told ABC News that investigators believe approximately 150 shots were fired in the incident. Interested in Florida School Shooting? Add Florida School Shooting as an interest to stay up to date on the latest Florida School Shooting news, video, and analysis from ABC News. A person close to Cruz called an FBI tip line on Jan. 5 with information about Cruz’s desire to kill people, erratic behavior, disturbing social media posts, as well as the potential of him conducting a school shooting, according to an FBI statement. “We have determined that these protocols were not followed for the information received by the PAL on January 5. The information was not provided to the Miami field office, and no further investigation was conducted at that time,” the FBI said in a statement today. FBI director Christopher Wray said the agency is still investigating and regrets any additional pain the information could cause to victims. “I am committed to getting to the bottom of what happened in this particular matter, as well as reviewing our processes for responding to information that we receive from the public. It’s up to all Americans to be vigilant, and when members of the public contact us with concerns, we must act properly and quickly,” Wray said in the statement. Candles that were placed on crosses still glow after last nights vigil for victims of the mass shooting at Marjory Stoneman Douglas High School, at Pine Trail Park, Feb. 16, 2018, in Parkland, Fla. The Broward Sheriff’s Office received “20 calls for service over the last few years” regarding Cruz, Broward Sheriff Scott Israel said at a news conference today. “We will continue to follow up as we do with any investigation. We want to try to find out why this killer did what he did, what we can learn from it and how we can keep our kids safe moving forward. So everyone of those calls to service will be looked at and scrutinized,” Israel said. FBI Director Christopher Wray in Washington, D.C., Feb. 13, 2018. Florida Governor Rick Scott,(C) walks to the media to speak about the mass shooting at Marjory Stoneman Douglas High School where 17 people were killed yesterday, on Feb. 15, 2018, in Parkland, Fla.
Students released from a lockdown are overcome with emotion following following a shooting at Marjory Stoneman Douglas High School in Parkland, Fla., Feb. 14, 2018. Hannah Carbocci, a 17-year-old junior, told ABC affiliate WPLG that she was in a first-floor classroom when shots rang out. “We had four to six people injured in our classroom, and two of them have been confirmed that they passed away,” she said. “It was a horrible experience, the sounds that you hear, the sights that you see. When you’re walking out of the building you see people in the hallways laying there dead that you know, that you went to classes with, and you went to school with, and you saw them every single day. Students Nicole Baltzer, right, and Alex Debs, embrace, Feb. 15, 2018, in Parkland, Fla., during a community vigil for the victims of the shooting at Marjory Stoneman Douglas High School. 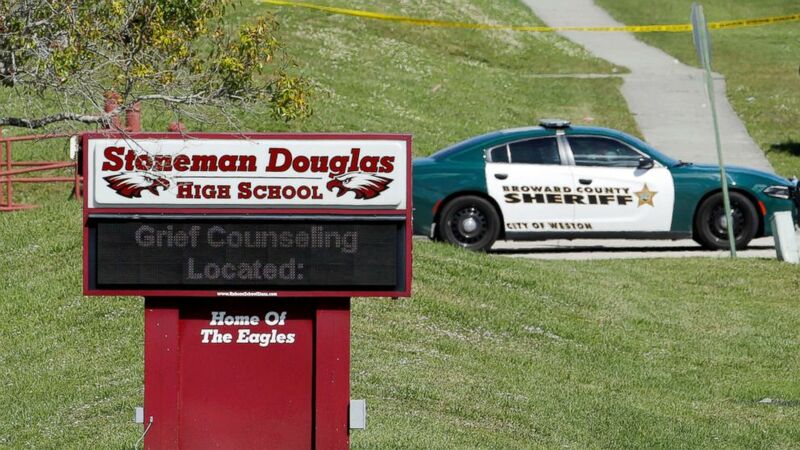 Cruz was arrested after the Valentine’s Day massacre at Marjory Stoneman Douglas High School and has been charged with 17 counts of premeditated murder. Cruz — a former student there — slipped away from the campus by blending in with other students who were trying to escape, police said. After a tense manhunt, he was apprehended. Nikolas Cruz is placed into handcuffs by police near Marjory Stoneman Douglas High School following a mass shooting in Parkland, Fla., Feb. 14, 2018. He briefly appeared in court Thursday and was held on no bond. Another neighbor, Malcolm Roxburgh, said Cruz would attack pets. He called Cruz a “strange character” who always stood out from other teenagers in the neighborhood. Nikolas Cruz is seen here in his mug shot, Feb. 14, 2018. Roxburgh’s most vivid memory of Cruz is his roaming the streets. Even in South Florida’s sweltering heat, Roxburgh said, Cruz occasionally walked around in a camouflage jacket. The firearm used is a Smith & Wesson M&P 15, a variant of the popular AR-15 rifle. Law enforcement sources said the suspect bought the rifle himself nearly a year ago and investigators believe no laws were broken in the purchase or sale of the weapon. Outside view of Sunrise Tactical Supply store in Coral Springs, Fla. on Feb. 16, 2018 where accused school shooter Nikolas Cruz bought an AR-15. The Bureau of Alcohol Tobacco Firearms and Explosives (ATF) is looking at whether Cruz had any help or accomplices. “Our goal is to figure out, how did this gun get into his hands?” ATF Special Agent in Charge Peter Forcelli told ABC News. Investigators are continuing to look into Cruz’s mental health history. Law enforcement sources told ABC News that Cruz told investigators he had been hearing voices in his head that directed him to conduct the attack. Under federal law, any person who has been “adjudicated as a mental defective” or “committed to a mental institution” is prohibited from shipping, transporting, receiving or possessing any firearm or ammunition punishable by a $250,000 and/or 10 years in prison. That adjudication must be done by a court, board, commission or other lawful authority that determines if a person as a result of “subnormal intelligence, mental illness, incompetency, condition or disease” is a danger to himself or others, lacks mental capacity to conduct their own affairs, are found insane by a court in a criminal case, or incompetent to stand trial because they lack mental responsibility.